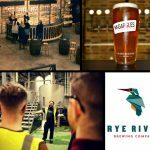 Located on the Dublin Road in Celbridge, Rye River Brewing Company was founded in November 2013 and has quickly grown to be one of the biggest Craft Breweries in Ireland. Rye River produces a range of multi-award-winning beers, including ten of our own brand McGargles beers. We also supply private label contracts to Lidl under their Crafty Brewing Company Brand, and we supply some exclusive brands to Tesco and Dunnes, Solas and Grafters beers, respectively. We have also recently released the first in a range of Limited Edition Seasonal small batch beers under our own Rye River name. We only use the finest quality ingredients and processes to brew our beers. We source the freshest hops and the finest malt to brew great tasting, awarding winning beers. We propagate our own liquid yeast in house and we put our water through a reverse osmosis process to guarantee purity. Our dedicated and creative team are consistently innovating and creating new recipes. In 2017, we opened our brewery to the public. Our Brewery Tour begins with our Beer Specialist, Simon, guiding you through each step of the brewing process first hand, from the milling of the malt to the labelling & bottling of the beers. After which, you will get the chance to sample some of the beers for yourself in a brand-new visitor experience area directly overlooking the brewery.